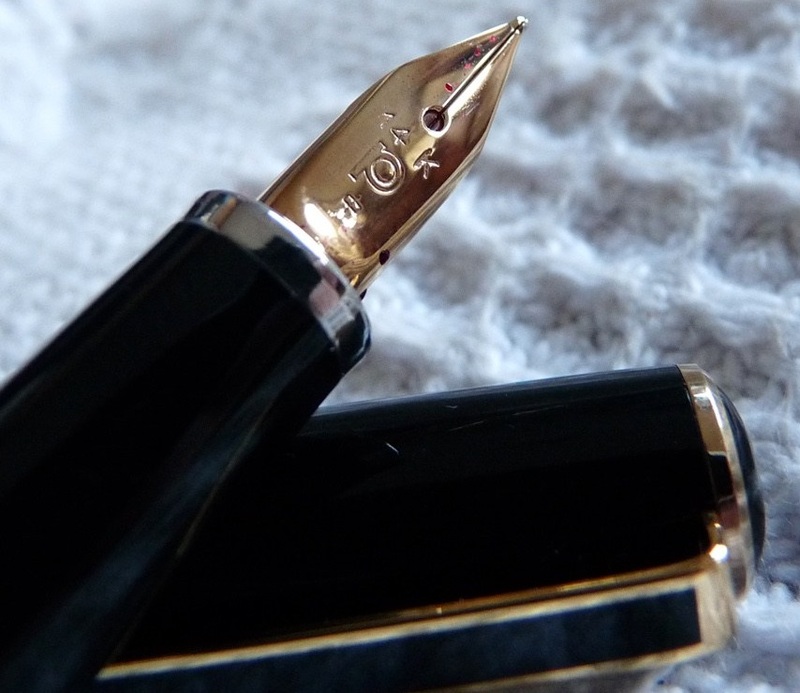 A little bit of history By now most of us have come across or used a Platinum Preppy – it has that smooth nib and a well-earned reputation for great value for money. There is, however, no getting away from the cheap feel that the pen has, particularly due to the printed barrel. The Plaisir is the natural next step up, and it’s been recently updated by removing the matching coloured nibs, giving it a more professional look. How it looks There is a wide choice of colours available and we were each sent a different one to take a look at. 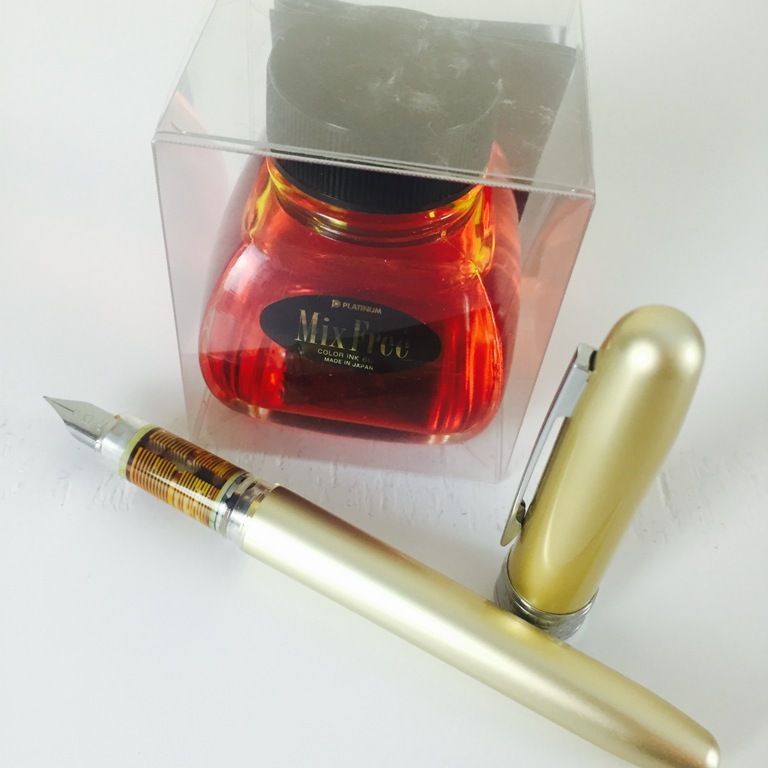 The cap and barrel has a nice sheen to it, and the grip section is translucent allowing you to see the ink flowing through to the nib. Whether you like this combination or not is a matter of taste, but there are definitely members of each of our households that have a keen eye on this pen. How it feels For an inexpensive pen we all felt it was well built. 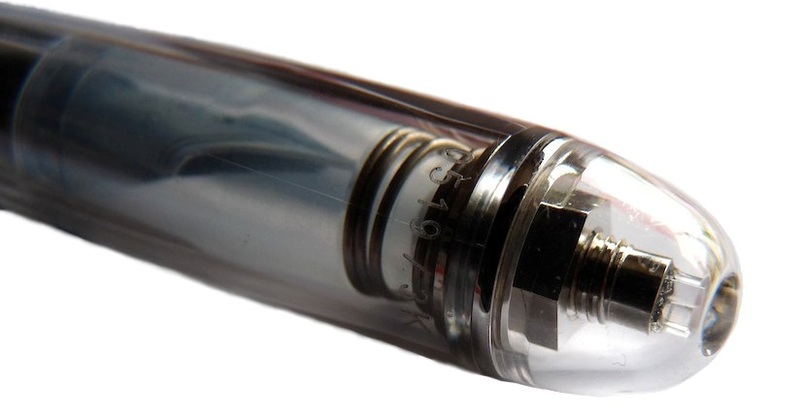 It’s a very lightweight pen with a secure seal on the cap. How it fills This can either be used with dedicated Platinum cartridges or with a Platinum converter which needs to be purchased separately. 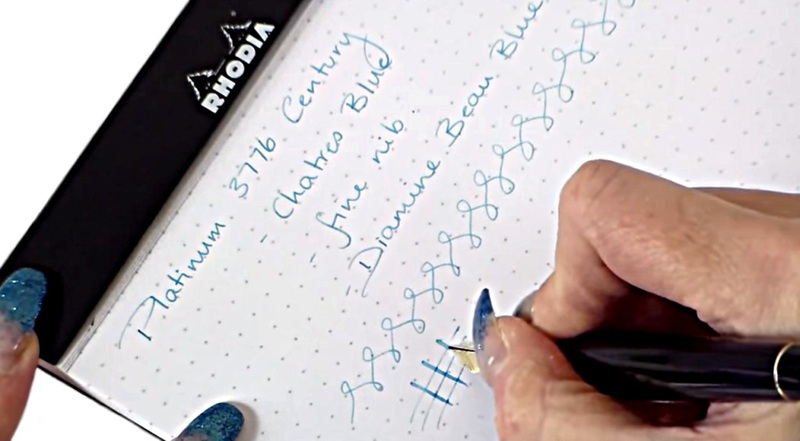 Crucially, how it writes… The Plaisir is available with either a 0.5mm or 0.3mm nib. Great writing experiences were had by us all with both nib sizes. It wrote very, very smoothly. 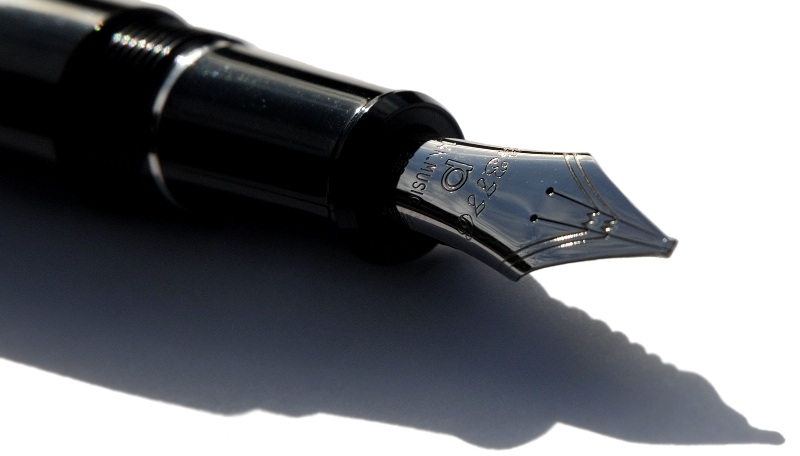 This pen costs less than £10 … for this price we haven’t had a better writing experience. Pen! What is it good for? 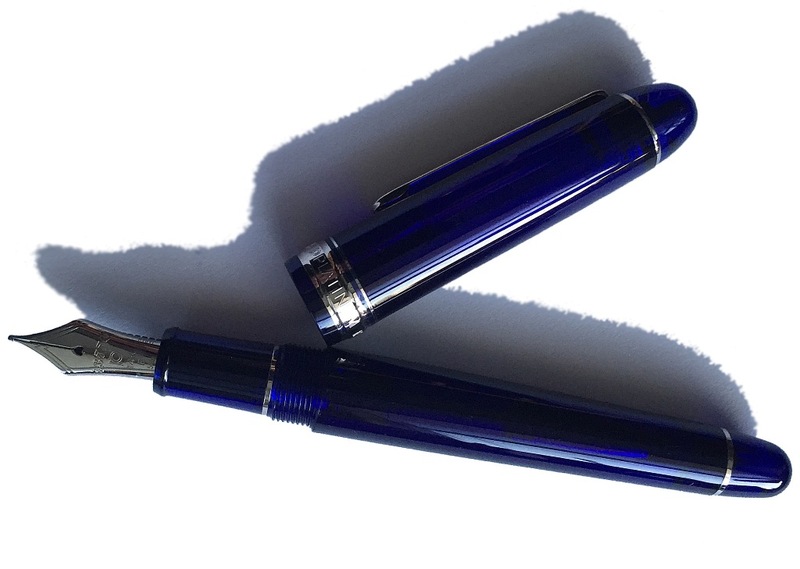 A great starter fountain pen which will give users a pleasurable experience, and an everyday workhorse for daily duties. VFM Well … the question almost doesn’t need answering. It’s fantastic value for money. If this isn’t quite your cup of tea, but almost… You won’t find better for the bucks! If it’s a little too ‘sparkly’ for your tastes you could look at the Lamy Safari range or the Faber Castell Basic, but you will have to part with a few more Pounds for these two. It is Christmas soon, however, and for that reason sparkle should always be welcomed! Our overall recommendation Go for it. Whether you are looking to buy a gift for a friend at Christmas who is starting out, or just looking for a good writing experience in a pen you wouldn’t worry too much about if it was ‘accidentally’ picked up by a colleague or family member. Where to get hold of one We got our models from Cult Pens, who are one of a few on-line retailers here in the UK offering this model. 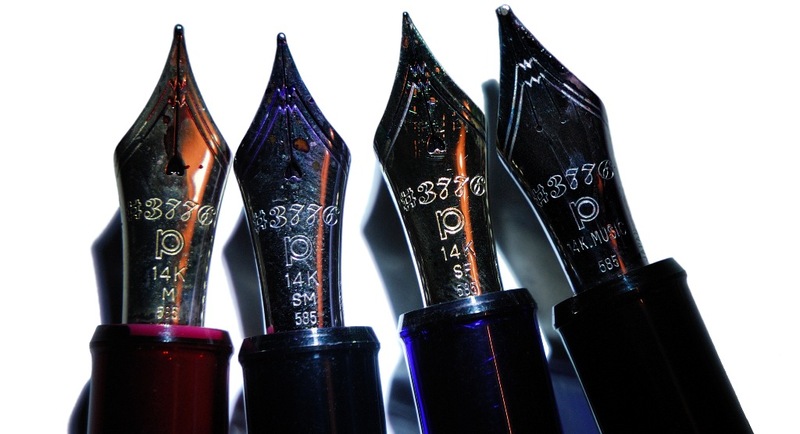 Thanks to Cult Pens for providing us with samples and ink for this review. A little bit of history One day in the 1920s, Hungarian journalist László József Bíró was musing on the strange properties of newspaper printing ink, which could adhere to any sort of paper and dried quickly. Naturally enough, he tried putting some in a fountain pen, but it gummed up the feed and he got nowhere. So, he tinkered and tweaked and redesigned the old ink pencil with a rotating sphere applicator, and thus the ballpoint was born… and generations of children didn’t learn to write properly. Hey ho, these things happen. Now though, thanks to a bit of a breakthrough from Platinum, we know that Bíró just exercised his admirable creativity in the wrong direction, opting for mechanical engineering when chemical engineering would have done just fine. 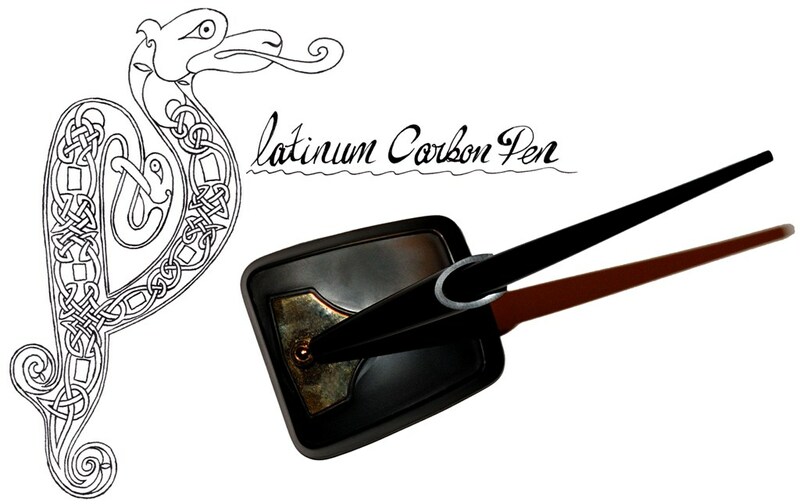 The Carbon Ink is permanent, fast-drying and writes on almost anything, and Platinum have produced a pen to go with it – which can supposedly withstand any propensity to carboniferously pigmentoid agglomerations (or ‘sticky stuff’ as we call it technically). Three of us decided to put the Carbon Pen to the test. How it looks It’s long; very, very, long. ‘Slim, too. It looks classy with its shiny black barrel and gold accents. Sat in the desk holder (an optional extra) it looks very sophisticated and is, perhaps intentionally, reminiscent of a quill. The included temporary cap, though, is an ugly hexagonal thing which is best disposed of quickly – the best thing that can be said about it is that it’s very functional. How it feels The Carbon Pen is light and the length makes it sit nicely in the hand. It’s easy enough to hold for long periods of time. 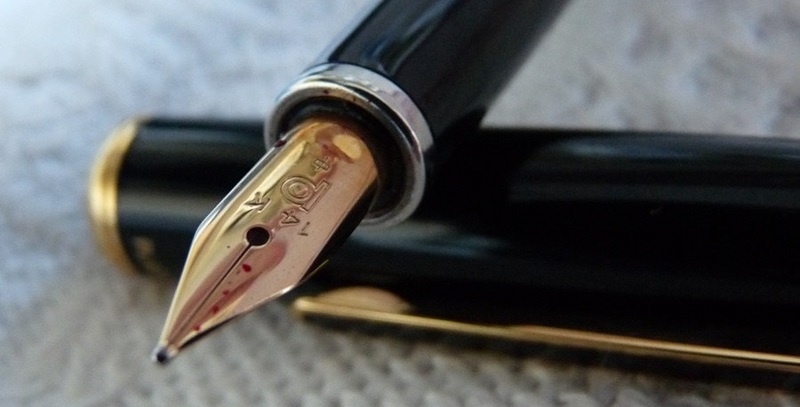 You can often feel the nib tackling the texture of the paper too – which can be a mixed blessing, depending upon the purpose you acquire the pen for. How it fills It’s a proprietary cartridge/converter filler. Although designed with Platinum’s Carbon Ink in mind, get a syringe and there’s nothing to prevent you from using any ink you like. 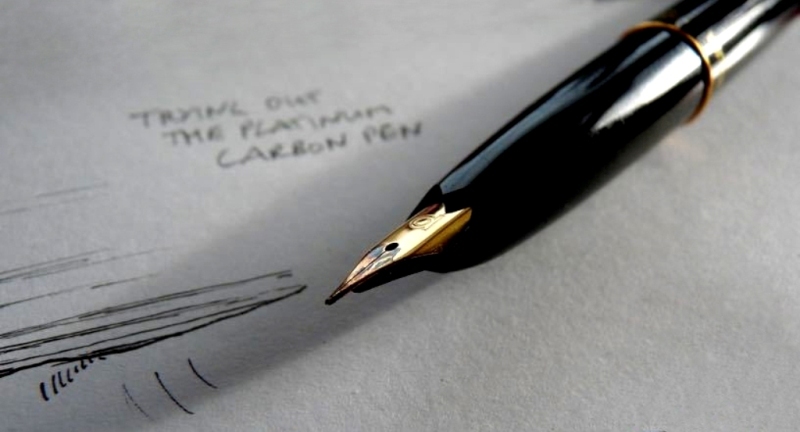 Crucially, how it writes… We found it a little tricky to actually write with as the extremely fine and very stiff steel nib does provide a lot of ‘feedback’ – which some people like, but wasn’t so much to our tastes. It was a different matter when it came to drawing, though, as the ultra thin line it gives, using waterproof ink, is perfect for ink and watercolour sketching. Pen! What is it good for? 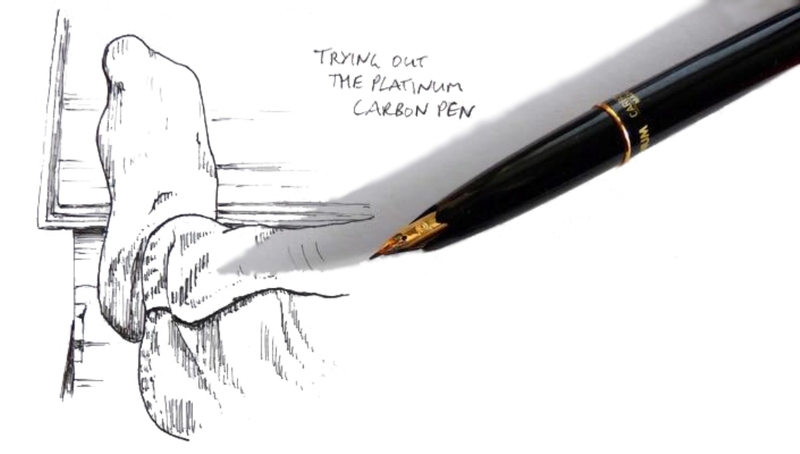 The Platinum Carbon Pen is very good for drawing, but probably not so good for writing a novel. It would be useful for making notes, maybe working out some maths, or other tasks where small writing or precision is important (such as designing fonts, we’ve discovered!). Because it writes on just about anything it can also come in handy in situations where submitting to Mr. Biro’s invention would otherwise be necessary; for example, it writes on glossy wall calendars and can even handle a newspaper crossword. VFM Oddly, the stand costs more than the pen itself – perhaps on the understanding that the pen unit can be affordably replaced if it does ‘gum up’. But to buy both together shouldn’t set you back much more than £20, and for a pen this unique (and useful) we think that’s quite decent value. If this isn’t quite your cup of tea, but almost… There is not much to compete with this really, at least at this price point. 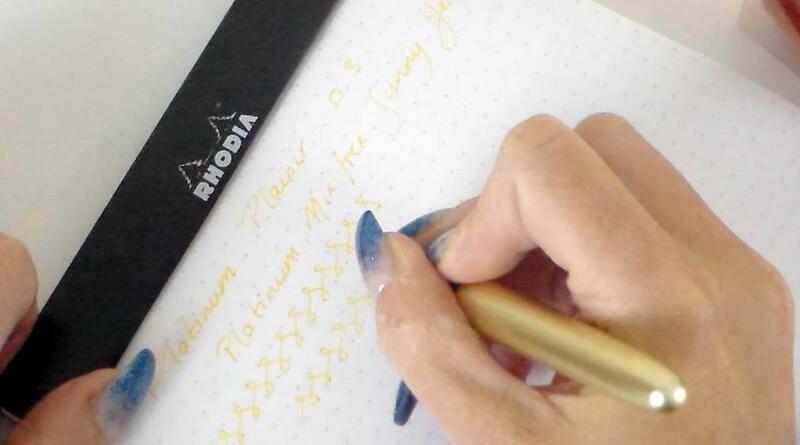 Some of Platinum’s gold-nibbed fountain pens like the #3776 can handle permanent inks, but these cost ten times as much and need very thorough rinsing-through afterwards. 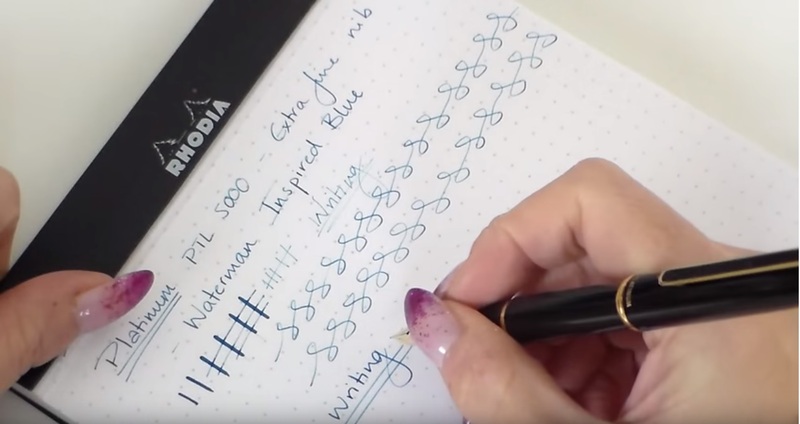 If it’s an affordable ultra-fine nib you’re after, the Pilot Penmanship is also worth a look. Our overall recommendation We feel this is a pen that’s absolutely great for one purpose (sketching and drawing) but not so good for another (writing). It’s a fantastic price, though, and definitely worth considering if you’re after something a little different to add to your artistic arsenal. Where to get hold of one Cult Pens sent us these review samples and they are one of just a few places in the UK where they can be found. They’re much more commonly available overseas. Thanks to Cult Pens for supplying us with three test units. 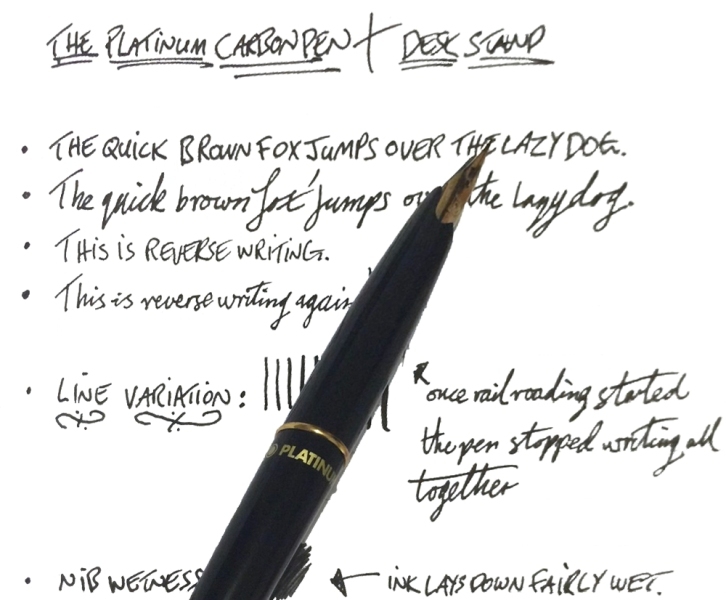 At the time of writing they are offering 20% off all Platinum products, making this pen even more of a bargain.